Been searching for a Duramax to pull my trailer and have not found the perfect one. The Gio and Sal were very courteous, worked with us on our trade. The Duramax is really nice, great value and extremely happy! Thank you guys! Had been looking for a clean no rust Chevrolet Duramax. Could not believe how clean this truck was, absolutely an amazing looking truck for the year and miles! 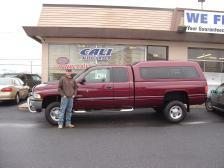 And the price was outstanding, true to what is advertised, "Wholesale Trucks". Thanks. Looking for a great truck and finally found it! Prices are wholesale and the trucks are like new! They are all stored in the indoor show room. Thank you guys! These guys have some real nice trucks and at a great value. I was treated really fair and the experience has been amazing! Class act and definitely not the run of the mill dealership. Thank you so much for all your help! Well these guys were very helpful and great help! A Duramax is very difficult to find especially one in great condition! We do not like sales people and very skeptical of them, as many I'm sure. But these guys were honest from day one! Truck was as they described very clean for the year and they sell everything with new inspections ready to go! I can not be any happier. Next truck I buy is going to be from Cali! Thank you guys, made my 1.5 hour drive well worth it! You were very honest and up front with me. I traveled everywhere and have been looking for a powerstroke for a while, other places had lied about the condition and over truck... You guys were honest from the start! 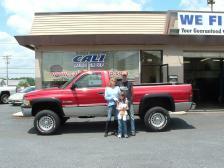 The truck looked great, drove wonderful and its true what you advertise, Wholesale Trucks! Thanks again and keep up the great work! I was looking everywhere for the best deal, even drove out to Ohio. After being disgusted how other dealers were not being truthful, my friend told me about this truck sitting at Cali Auto Group. Was very amazed on the condition of the truck and how it ran. Considering all the trucks I went to go look at and wasted lots of time and money, I am glad I came down to Cali. I needed the truck to haul cattle, this one did not have a fifth wheel in it and Cali helped me out with it. Very happy about my decision, thanks! Was looking for financing and needed a good car for work that gave me good gas mileage. This TDI is perfect thank you for helping me out with financing and what I needed! Thanks guys! Bought a wolfsburg edition, very nice clean, great shape and runs good! All I can say is WOW! I need to express my feelings and gratitude with the Cali's! First off its a family owned operation so I did not have high expectations on my way to the dealership but the reason why I decided to take the drive is how genuine and nice both Giovanni and Sal were with me over the phone.  After a 40 minute drive, I had arrived to the dealership and I was pleasantly impressed with how clean and neat the lot, building and vehicles were... 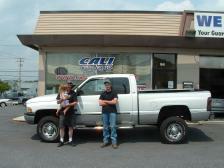 When I saw the truck I had called about, I was extremely impressed with the condition inside and outside of the truck! Very Very clean, straight looking truck! I went on a test drive with Sal and let me tell you I really fell in love with the truck (especially after test driving a couple other one's), these guys knew what they were talking about and really upfront, honest people! I was extremely honest with them about my situation, do not care for financing and I'm working within a budget. They are very understanding and helpful in so many ways as far as the whole transaction. When we finally made a deal work I had requested a couple minor things and Sal was not hesitant to assure me that he wants me to be content and as long as I'm happy that what really matters! I took one last look at the truck and mentioned the bed liner is not as nice as I would like it to be but it is something I could live with since both Giovanni and Sal have been really genuine, respectful and providing me with all my requests! Well, when I thought we were done, Sal says to me "you mentioned something about the bed liner... 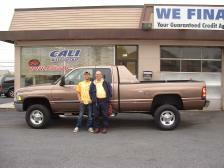 I want you to be happy about everything with this truck, we will replace the bed liner for you." OMG, I told him no need! You have done enough for me, you do not have to do that... He insisted and I could not tell him other wise, This experience I had with both Giovanni and Sal was absolutely incredible! If your worried about purchasing a car, these guys treat you like family, I can not believe how great I was treated by these two men, it is just amazing and If I did not experience it, would not believe it! Thank you so much! Both of you went well beyond the level of customer service that anyone could expect! I wish you the best for both of you! Thank you again! Was looking for something nice and at a great price! Got exactly what I wanted! OMG I can not thank you so much! 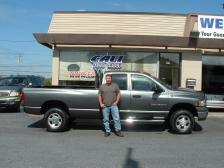 I had a vehicle that was not in the best condition and needed a new vehicle asap! I needed to finance but wanted to go somewhere respectable, honest and purchase a good running vehicle! Even with credit challenges, you were able to help me out! I finally have a car good car financed and ready to build my credit! I am so excited and relieved at the same time! Thank you for working with me from the vehicle I needed and payments on the vehicle! Thanks! I had just moved to the area not too long ago and was in need of a good reliable car or I would of been out of a job! Cali's saved my job and now I have a good running car to go to work and enjoy some independence! Ever since moving to Palmyra my life has turned around and Cali made a large part of that happen! Thank you! Just wanted to say that it was really nice dealing with a low pressure, honest and up front individuals. What they told us was true and not only that, they are very knowledgeable individuals with there line of product. It is really dfficult to find a 6 speed manual Cummins diesel and on top of that finding one that is in extremely nice shape! We tend to own it for a very very long time and with only 85k miles, I am certain that it will be part of our family for a long time! Thank you very much. Cali, was the only dealership that gave me a chance. 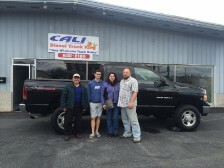 I first visited them about 6 months prior to purchasing my truck, I had a pre approval at the time and by the second time around everything worked out so I could drive off with it! 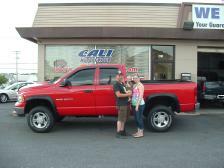 As I said Cali was the only dealership that would work with me and gave me a chance to purchase my dream truck! They worked with me even with limited credit and got a loan! The program is going to help me build my credit as well! Thanks guys, really appreciate it all you did for me! Thank Gio, My wife and I were very impressed with everyone and the truck itself as well. You made us feel like family throughout the process! Thank you for the great deal! Very happy. So, glad we came across Cali's. I was looking for a nice 3500 Cummins Diesel for a while. My grandfather was dining in Palmyra and this white Dodge 3500 Cummins with stacks caught his eye and thought it would be a real nice truck for me. I went down to look at it and it is was extremely nice! Took it for a drive and it was amazing, everything was tight very well maintained such a nice drive. We also enjoyed talking to the Cali's, very down to earth, nice people. My grandfather and I really enjoyed the experience and will recommend anyone to them. Thank you! Needed a car after my accident but I wanted something really nice. A friend had mentioned Cali Auto Group, I am so glad I met these guys. They were really nice and took good care of me. I was suprised how understanding they were about my situation and made everything was so simple! Love this car! I had been looking for a nice dodge cummins diesel with low miles for a while. Came across Cali Auto and could not believe the selection of the second generation of cummins diesel's they have available! It took me about an hour and a half to get to the lot, once I got there I could not believe how nice these trucks were! It is really difficult to find a second generation cummins diesel in decent shape in and out and these were the nicest trucks! Grant it, they are hard to find and when you do they are not in nice shape. Well I ended up buying a real nice 2001 with a little more miles than I wanted due to the price. I was not afraid of it anyway because they all come with fully serviced, which is really nice! 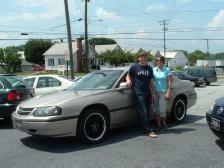 I also needed financing and suprisingly they helped me out and it was so easy to do as well! I could say I had a good experience would with them. 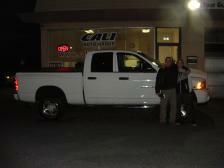 Thank's everyone at Cali Auto. I'm a mechanic and know these diesel trucks very well! I heard about Cali Auto and how the specialize on diesel trucks and people swore by this dealership. They have an amazing selection of Dodge Diesel trucks in inventory, low mileage, hard to find first and second generations. Well I was pre approved and ready to buy, I thought I was going to deal with another run of the mill dealership with sales people who lie to you. But let me tell you this place is nothing like that, at all! Operated by good Christian people and all they want is honesty in return. Like I said I was ready to buy, so I went in and told them I was pre approved showed them my check and also had a trade in, if I needed to put a little bit of money down I was able to do so! 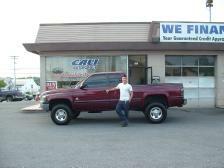 They told me what they have available within my price range and let me tell you, they have some real real nice trucks! The whole transaction was easy, quick and simple! These are the most honest guys you will meet and being a mechanic I have met a lot of people in this business! So, anyway I wanted to thank you guys for a great deal and a great truck, most of all thank you for your honesty! Will send everyone I know to you guys, especially if there looking for a good cummins diesel truck at a fair price! Needed to find a good and safe car for my daughter at a great price. I was going to finance but decided to buy it out cash. Got the cash together and came back to purchase this car for my daughter. She likes and it will work great for her! Thank you! Was tired of driving my truck back and forth from work and wasting all that fuel, so I started shopping for an economical car. Wanted something economical, great shape for a fair price. Was very suprised how everyone treated me, since it is a small dealership. Everyone there were very professional, down to earth and honest. The car is in great shape and ran outstanding. The timing belt was close to when it should of been changed and they changed it for me before picking up the vehicle. My wife and I are very pleased with everything. Thank you. I have a gas guzzler, which I bought new and did not want to trade it in but I wanted to find something as a second car that looks nice and would save me money on gas. The car is great and I got a great deal on it! Thank you Gio! Thank you for turning the week around for me guys. I had just recently totaled my cummins diesel and was looking for something just as nice, but affordable. I know these trucks can be very expensive but with all the driving I do I was not going to purchase anything else. Everyone at Cali's was really helpful even when the bank was unable to work with me Cali did. Thank you again, appreciate all you did for me. I was shopping for a second car with my wife and stopped by Cali Auto Group. Really enjoyed speaking with everyone there and felt like at home. We had an amazing finance approval, we saved thousands of money in financing charges compared to other dealerships we visited. 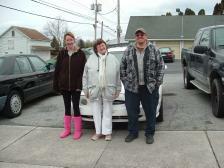 In addition to the financing, the Ford Taurus is such a nice car for the family. 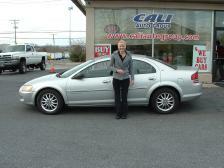 We love the power options and leather seats, runs like new as well. We were very suprised to get the service and a car that is next to new, runs very quite and smooth, impressed! Thank you for helping us out! We will recommend you guys to everyone! I'm self employed in the farming business and needed a 6 speed manual truck for work. I was in a bind, knew what I needed and ready to buy. When I first called Cali, told them that I did not have time to waste the pictures on there site looked amazing and if the truck was really how it looked. They assured me that if I was looking for a great clean truck all serviced and mainteance up to date that I will definitely not be disappointed and will be driving home with a truck. They seemed like real down to earth business men and probably good to do business. It was over an hour drive from where I live, once I got there I was actually really impressed with the truck! What they told me was true 100%, clean truck, absolutely no rust, all serviced and maintenance was up to date. I wanted to go for a test drive but the policy is to get a pre approval prior to test drives, there were no issues getting approved and I knew I was going to buy it if the truck drove like they mentioned. Before test driving the truck they did mention if there is any ligitimate concerns on the truck they would take care of it for me. They also stressed that they go over the trucks, all the service and maintenance is up to date, make sure that the truck is 100% to there knowledge before offering the truck for sale. Well, again they were honest and truthfull about that as well! 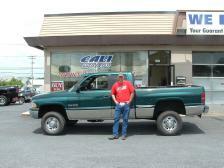 The truck drove amazing really nice inside of the truck was very clean no torn seats no cracked dash, let me tell you for a 2003 Dodge Cummins 6 Speed Manual with 171k on it this truck is amazing! You could not ask for a more nicer truck with body, mechanical and the interior. Being a business owner myself I did not want to be a headache for these guys especially since they have been up front, honest, very curteous to myself and my father. So I asked them if there is anything they could do on the price I would greatly appreciate it but would understand if they can not discount the truck. Once again they suprised me they helped me out as much as they could and I was really happy with the any kind of help they could of assisted me. Every little helps thank you so much! These men are true businessmen... Fair, honest, with integrity and know how to assist there customers. Definitely recommend these guys to anyone who is looking for a good truck or car. You will not need to worry about anything with them, in the hands of good Christian people! Thanks again guys! Thank you so much for helping me with a Volkswagen! I shopped everywhere, looking for a VW and needed help with Financing! Everyone was so helpful they assisted me in obtaining the financing that fit my budget with a very low finance charge amount. Really excited to have the car I have been wanting for a while now! Thank you so much! My husband and I always wanted a nice car, Mercedes or Bmw but it is really difficult to find a place that we can finance one. 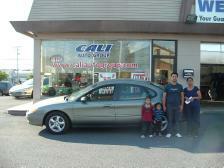 Cali's was very helpful in helping us with this great car and the financing that we needed. We are really greatful Thank you! 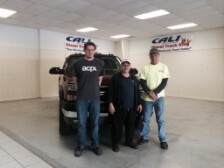 Was looking for my first Cummins Diesel and came across Cali Auto Group aka Diesel Truck King. They worked on getting the most for my trade and making everything work for me. Really enjoyed working with Everyone was very nice, knowledgeabl and informative. My Husband and I were looking for something with better fuel mileage than our car. We were having a difficult time finding a dealer who would work with us, since the car we were trading in had a loan on it. Everyone at Cali's worked very hard to make the deal work in our favor and we greatly appreciate it! Definitely will recommend anyone to Cali Auto Group. Thank you! My son had been looking for a clean nice cummins diesel for a while to pull his race car. We live in the Pittsburgh area but were spending some time with friends near Palmyra (about an hour or so away). My son was on his phone looking at trucks online and came across this white 2004 Dodge Cummins diesel from Cali's. 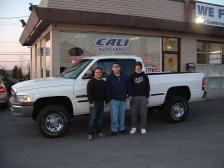 We called them up and after speaking to Giovanni decided to make the trip to look at this truck. Once we got there I started looking at the truck my kids were also looking at all the other cummins diesel trucks on the lot and I have to say they are all really nice trucks. Having owned my own service and body shop for as long as I can remember, I have to admit that the trucks that Cali offers are in great condition for the year and the prices. 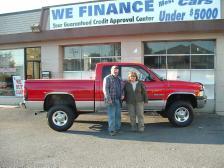 We asked if financing was available and how quick it would be to get an answer and test drove the truck. The drive was great, everything about the truck was wonderful, the only exception was the tires were good for about a year. We expressed our concern about the tires and they had called for a quote on tires. Once they receieved the quote they offered us the tires. We were very pleased on how they were accomodating us and asked if there was a good place to eat before deciding. We left to eat dinner came back shortly and decided to purchase the truck. While the preparing of the paper work they had offered us factory rubber Dodge Ram mats that they were going to use for there personal diesel truck. We could not believe how nice these guys were, for a small family owned dealership they handled everything really professional up front honest and very simple to deal with. 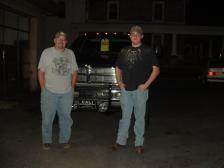 We took the truck with us that night and drove back home! Really appreciate it everything guys! Thank you so much! Was looking for a really nice well maintained, good condition truck, so I can purchase my camper and start camping this year. Finally found a real nice well maintained truck and these guys were really nice to work with as well. Thank you so much, really appreciate it everything! I am so excited to have found a nice truck within our budget! Been looking for a while, to find the truck that I wanted and finally everything has worked out. Thank you for working with our budget. Nice guys, up front and honest! The owner policy is before it is picked that it goes through the shop serviced and maintenance, nice to know that there are still dealers that take pride with what they offer and way of business. Besides that, I have been searching for a nice TDI for a while at a good price and they are hard to find! I am glad that I stumbled upon Cali Auto Group! Really love this car and can not wait to save money of fuel! Thank you so much for working with us, moved farther from work and now needed an affordable means of transportation also was looking for financing. Did not want to buy junk, so I decided to see what Cali's financing programs worked. Thank you so much for helping me out, now it will make it easier for me and my family and start planning for family outings-outside of the area! Was looking for a nice good used car for my son and this was definitely it! Couldnt beat the price great deal! Thank you guys! All I have to say thank you so much guys! I had a down payment walked into the office and began the pre approval process. The finance manager worked a lot to get me this gorgeous car! It took some time but they did it! I had no wheels and wanted a good car that not only runs great but looks amazing and these guys did it! I was up front with them and they were up front with me, I did not think it was going to work out but hey they did it just as they promised! These guys are awesome!!! Definitely will recommend them to anyone! Wow! Love the ride! Thanks again! Hey guys! I can not thank you so much! I was in need of a car really bad and you guys helped me out! I was out of a car for a while and needed good reliable transportation for once! I ended up purchasing this 2001 Stratus and am extremely happy with it! The car runs great no issues with it at all! What I enjoyed about it is that they also put me in a great payment plan for the car, I was worried since I needed a bad credit program for the car but they made it happen! I would recommend Cali's for anyone who is looking for a good reliable car and need help with financing. They will make it work for you! Cant thank you enough! SO EXCITED!!!! I was in desperate need of a car since my work is about 20-30mins away from where I live! I did not expect these guys to help me out because, I knew it was going to be a long shot but this dealership caught my eye and I stopped in! I loved the car so nice local vehicle from the Hershey area, such a nice car... The finance manager took all my information and was working on it for a while, it was actually making me nervous because, every other dealership I had stopped by did not help me at all! Well when they told me I was pre approved, that made my day! Even though they told me it may not mean it is a 100% approval but I kept on hoping this would work. I got the final word, your approved and I was the happiest person in the world! These guys are extremely nice hard working guys, they were there to help me out like they told me and they did! Thank you so much, I will never forget this and will recommend Cali Auto to everyone I know! You guys are the best! Keep up the good work because there are a lot of places that do not care about helping others out! You guys went above and beyond and made sure that I was very well taken care and the most important you kept your word, very honest, very truthful! We need more people like you guys! Thank you! Was Looking for a good farm truck to use around the farm and a great deal! Everyone at Cali's were very helpful and were able to help me out! Love the truck it is going to be a great addition to our family. I was looking for a second vehicle small pick up truck for better gas mileage. Came across Cali in the book and decided to call them. After talking to Giovanni decided to the trip down about 45 minute drive from where I live. 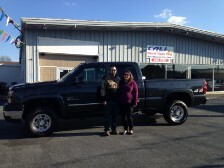 The truck looked good and drove great the only, I wanted to be within a budget so I told Giovanni, the most I could afford for a second vehicle and he was nice enough to accommodate me. Shook his hand told him I will be back with the money. It is nice to know that there are still old fashion way of doing business, today's world. The experience was simple, quick, honest and wonderful! Wanted to trade in my vehicle and was looking for financing and everyone at Cali's helped me out with everything from the trade to financing! Everything was simple and quick, non stressful! Was looking to buy something right away, that fit my budget and ran good. Great deal, the process was very simple and quick. I must say, I have really enjoyed dealing with Cali. Very simple, honest, straight forward people. 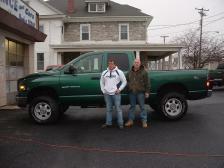 I bought this truck right when it came in! The truck had no service, no inspection but it ran 110 percent. I am a mechanic and was not looking for a good deal, this truck was a steal for a 6 speed manual. Thank you guys! Great price, was amazed with the condition for the price of the vehicle! Enjoyable experience. Great experience! Easy to work with, quick financing and back up what they tell you. Very pleased with the whole transaction! Everything was went well and love the car! 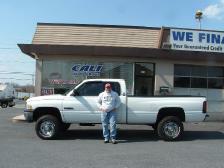 I am from York County and found Cali while searching for a good car for my work. I work in sales and I could tell you, I really enjoyed dealing with both Cali's. They both were honest and up front, no gimmicks, no tricks. By far you guys have the best prices with the quality of product you offer! Can not beat it, keep doing what your doing! I was searching everywhere for a car but I can definitely say that these guys have the nicest and are very down to earth up front and honest, someone I would recommend and deal with in the future! Thank you guys and keep up the good work! Love this truck! Thank you so much, really appreciate it how you guys worked with me on my trade and the payments! Great team effort on both Giovanni and Sal. Appreciate the honesty and being up front, definitely up front good honest people! Would recommend you guys to anyone! Good luck with the business and thank you again! Love the truck! I was in a rut with my old car, needed a car that is more reliable and respectable. Cali Auto Group has real nice cars and advertise buy here pay here! At first look it does not look like a buy here pay here lot based on how nice the vehicle look, drive and how nice the staff is with everyone. After working on the financing for me they were able to get me approved on a great payment plan! The payment plan was a lot better than I thought it would be, payments were very affordable and the loan was not long term! Really pleased on how everything was handled and excited to be driving this sleek nice looking car! I had been trying to find a Dodge Cummins in nice shape and low miles. I just bought this one with less than 100 thousand miles on it, very nice clean truck in the inside and good shape on the outside. They made everything simple and easy to deal with. I had been searching high and low for a 6 speed manual cummins diesel in good shape. I am very picky about what I want and have been to tons of different dealerships hoping that they have what I'm looking for and in great condition. Cali was the lowest price for the quality of truck they offer. 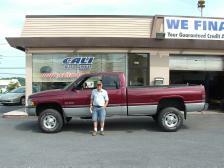 The truck is like new all maintenance, serviced and lower price! The other thing was getting financed, so difficult! These guys had no problem financing me for this truck, the finance manager told me he would do his best and was pretty confident in getting me financing, I gave him a try. I could not believe he did it, he got me financed! Was really happy to hear it. 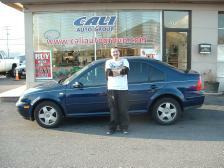 I am just very pleased with my experience at Cali's, from the vehicle to the financing to how I was treated was awesome! Thank you guys. Having a cummins diesel has been my dream. I went to all the dealership possible, and no luck getting financed or finding something nice! I finally met Cali's and let me tell you, these guys worked so hard for me. They were always positive through the whole time in trying to get financing for me. The finance manager worked very hard in making my dream come true! 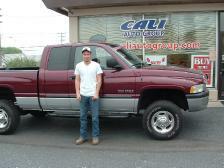 I got an awesome truck financed and finally after many years I have what I always wanted! Thank you so much guys! Love this truck! Thank you again! I'm glad I found these guys! I have been looking for a 6 speed manual cummins diesel for the longest time now! Everywhere I looked either they were asking way too much money or the trucks were in really rough condition. Cali has amazing clean trucks, very impressed I stole this truck and not only that it is a great looking and running truck! All serviced ready to go very clean. Luckily I called them right when the truck was coming in and now I'm driving home with it! These guys are really great, I had a tough time getting financed and they made it happen! I didn't believe it at first because of all the banks I had tried to get financed on my own, never worked out but these guys were honest straight forward and made it happen. 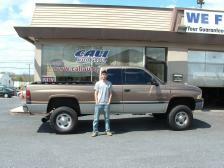 And to top it off it is the nicest truck I have seen and I saved thousands of dollars! Cali's know what they are doing and treat you the way you should be treated, like family! Thank you so much! I got such a great deal! I had an intrepid which ran over 200k miles and finally died out on me. I was searching for the same car, since I had such great experience with my last one. Cali Auto Group was about a little over an hour away from me but after looking at the pictures of the car, talking to the guys about the car, I had to go and see it for yself! The car was exactly how they described it, it is a 10+ year old car but it was in amazing shape drove great and all the service was up to date on the car. Would never think a small dealership would take so much pride in how they operate, they tell you everything known, show you all records, and stick to there word! Definitely enjoyed dealing with them, wish more people were honest and up front. I thank you for the honesty and ease of transaction. My significant other and I were looking for a car, since he works at Cali's we decided to take a look at some of there vehicles that may be in our price range. There were a few vehicles just traded in we decided on this Toyota because it was convertible. What is nice is that there policy is to go through all the vehicles to make sure they know and disclose everything known about the vehicle. Love the car, thank you! Great deal! 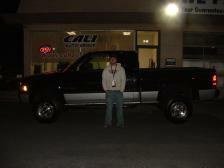 I was shopping and Cali had the nicest truck for the lowest price! This truck is extra clean, 4 new tires, all serviced and maintenance up to date and for the lowest price! Does not get better than that! I traded in a 2005 Jeep Wrangler 6 speed manual 6 cylinder because I needed more room for my family. I did not want just any truck, I was very picky in the process and found exactly what I wanted. Amazing looking truck, clean, powerful, great for the family and still can have fun! We had been looking for a while to purchase a car for our son. Wanted to make sure we found something for him that is safe, in good shape and a great value! 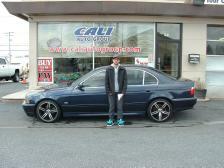 Everyone at Cali auto group has been extremely nice, helpful and simple to work with through the whole purchase process. What we really enjoyed about the whole experience was that we were treated like family everything was transparent and simple. On top of it the vehicle that we purchased is in great condition, runs great and the most important is that my son loves it! I was looking for a good deal and get financing to build my credit. The car was everything I was looking for, loaded looks and drives great! I was offered a warranty plan but was confident to buy it as is. 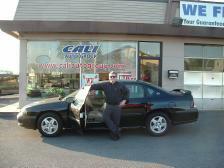 Cali auto helped me get financing through a finance company to build my credit, very easy and quick! Working with people at Cali's was very nice experience, easy, professional and low stress! Thank's guys, will recommend you any time! I had been looking for a diesel for better fuel mileage and bought a VW TDI from Cali's about a year ago. Really loved my TDI but it was a little too small for me, saw that Cali's had some Mercedes Diesels and decided to stop by and check them out. They told me the differences between the TDI and Mercedes Diesel, after thinking it over it just made a lot of sense to me and for the size of the car it gets great fuel mileage! I really enjoyed dealing with Cali on both buys, would recommend them to anyone! Finally found what best fits me from comfort to fuel mileage! Thanks guys! I had been looking for a diesel for better fuel mileage and bought a VW TDI from Cali's about 6 months ago. Really loved my TDI but it was a little too small for me, saw that Cali's had some Mercedes Diesels and decided to stop by and check them out. They told me the differences between the TDI and Mercedes Diesel, after thinking it over it just made a lot of sense to me and for the size of the car it gets great fuel mileage! I really enjoyed dealing with Cali on both buys, would recommend them to anyone! Finally found what best fits me from comfort to fuel mileage! Thanks guys! Wife and I were on our way to purchase a HEMI, until we saw Cali Auto Group with so many cummins diesel trucks and decided to stop and take a look at one. 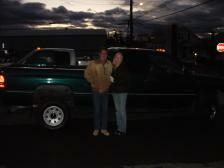 We were so suprised with the condition, price for the year and miles we took the truck for a test drive. On the test drive we disccussed with the sales consultant why we were looking for another truck and really wanted to purchase a diesel but the ones we saw were really expensive. 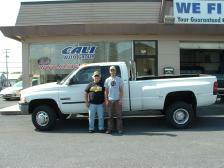 It was a blessing to come across Cali Auto, cummins diesel gives you 23mpg, power and torque we can not beat! Also at Cali's it is so affordable to purchase a diesel we can not believe we did not know about them before hand! 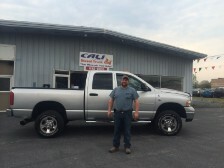 We called the credit union right after the test drive to draw the check with Cali Auto and the diesel truck we were purchasing, the guys at Cali were very professional and it was a very simple transaction between the credit union and Cali Auto Group. We actually got what we really wanted, Thank you so much guys! Definitely recommend them to anyone! Have been looking for a second generation 6 speed manual Cummins diesel for a very long time! This is the only place where, I have found the nicest Cummins diesel trucks and for that matter a 6 Speed Manual (they are extremely difficult to find). Thanks to all the guys at Cali's. Definitely will recommend them to anyone, especially if someone is looking for hard to find extremely nice Cummins! Wow, I love this car!!! 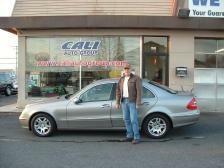 I have bought 3 diesel cars (VW TDI, 1999 MERCEDES DIESEL and now this 2005 MERCEDES CDI!!!) from Cali's within one year and have been very pleased with each car purchased ! What they say is true, upfront, honest, fair and easy to deal with them. They service all the cars they sell and make sure that the customer is happy with the vehicle and how they have been treated. Definitely not a high pressure dealership but more like family and friends atmosphere. There pricing is great amazing and the condition of the vehicles are really nice! Definitely would recommend them to any one who is in the market for a great used car, at a great, price and is tired of dealing with high pressure, pushy, dishonest dealerships! This car is amazing guys and thank you for the great deal!!!! 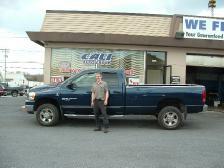 I was selling my ford F250 7.3 Power Stroke diesel and was searching for an economical car to run around in... 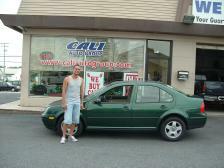 I had stopped by Cali Auto Group to look at this 2002 VW TDI, drove it and fell in love with it! Also, Cali had completed all the service, maintenance and inspected the vehicle for me, before picking it up! I was not expecting that but they offered and it was actually really nice of them to do that without having me request it... I would definitely refer them to anyone and do business with them again! I thank you for making my experience stress free and easy! My name is Randy from the York area. I had a 1970's van that was costing me a fortune and was looking for a cheap car! Came across these guys in the paper and I could not believe my eyes 1999 Ford Taurus wagon, only $900.00 Cash! Wow, I drove up here and the car wagon in good shape, we jump started the car and it was so quite the engine was so silent and solid! Just needed the car for a daily driver and this was perfect! These guys are really nice Christian people, honest up front and sincere. They tell you everything up front of what they know about there vehicles and if the vehicle has been serviced, all records are available! Thank you guys! 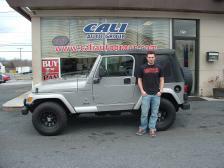 I had been looking for a nice Jeep and came across this 2001 Wrangler 60th edition. Jeep is in great condition looks and runs great! I was in a bind with the my current car, the only way I could start it was by popping it into gear... I did not know who would even want to take the car but once I called the guys at cali they wanted to know the service history and if the car was in good shape and I told him my car had an issue starting but the engine and clutch is in good condition he asked me to bring it because he would definitely be fair with the trade in value but he could not give me a number over the phone. 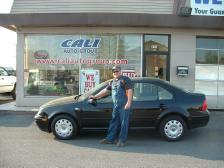 I brought the car here Cali Auto and I could not believe how fair these guys treated me! I am extremely happy that they could of taken the car off my hands because nobody that I took the car to in order to get fixed knew what the issue was! So I got rid of my car and got this nice Jeep, thank you very much guys for helping me out!